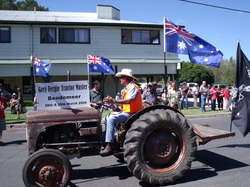 The first Grey Fergie Muster was in 2003 and came about when Bendemeer resident and sometime bush poet Winston Doak wanted to celebrate the 50th birthday of his Grey Fergie. Fellow resident Lee Martin suggested they have a party and invite the rest of Australia – along the way they thought they could create a record for the most number of Fergies in one place. The Grey Fergie was manufactured between 1946 and 1959. It is technically a TE 20 Ferguson. They’re grey because it was the cheapest colour to produce post WWII. They had the first three-point linkage system manufactured by Harry Ferguson, which makes it more mobile in small area farming. The muster seeks to celebrate the important role it has played in our agricultural history. At Wentworth, on the junction of the Darling and Murray Rivers, the little tractor was made famous when both rivers flooded in 1956 and a fleet of them went to work to build levee banks which saved the town.